John Lloyd Cruz graced the first Cinema One Drive-In screening event held last September 27 at the Greenfield District. Despite inclement weather and traffic jams, fans came in full force to watch the free screening of It Takes a Man and a Woman at the first Cinema One Drive-In screening event last September 27, Friday, at the Greenfield District. The rains had subsided by the time lead star John Lloyd Cruz arrived to thank his fans for supporting the third installment of the 'kilig' Laida-Miggy tandem. He also complimented the organizers of the event: “More than watching the movie, I think it’s the experience of the drive-in cinema that the viewers came out for. I’m sure most, if not everyone here, has already seen the movie, yet, they still came to watch. Indeed, it’s a different experience." Ronald Arguelles, channel head of Cinema One, said the Drive-In screening was conceptualized as part of the cable network’s lineup of outdoor movie screenings. 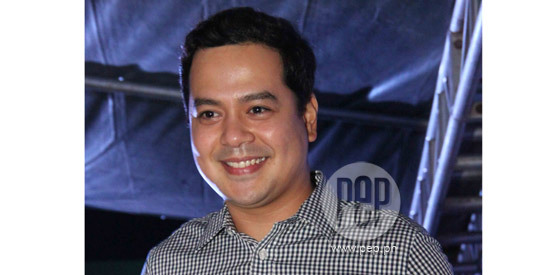 For John Lloyd, it was a good occasion to thank the fans for the support of the movie. But after less than a minute, he confessed: “But after we released this movie, Ma’am Charo [Santos-Concio of ABS-CBN] was insisting on a part four. So, we’ll see." Cinema One Originals. Ronald said that Cinema One regularly holds outdoor screening events. He cited Boracay during the summer and upcoming in time for Halloween is the Tagalog-dubbed Mario Maurer horror-comedy Pee Mak. He also mentioned the much-awaited Cinema One Originals Film Festival. This year, it will be held November 10-19 in three cinemas: Glorietta, Robinsons Galleria, and Trinoma. The film Ganito Kami Noon, Paano Kayo Ngayon by the late director Eddie Romero will open the festival. This 1976 classic film has been newly restored by ABS-CBN and Central Digital Lab. It stars Christopher de Leon, Gloria Diaz, Eddie Garcia and Leopoldo Salcedo. There will be 15 films in competition. Five in the Cinema One Plus (P2 million budget) category, namely: Kabisera, directed by Borgy Torre and starring Joel Torre, Meryll Soriano, Bernard Palanca, Art Acuña, Bing Pimentel, Ketchup Eusebio, and Carlo Cruz; Woman of the Ruins, directed by Keith and starring Alessandra de Rossi, Art Acuña, Elizabeth Oropesa, Peque Gallaga, and Chanel Latorre; Alamat Ni China Doll, directed by Adolf Alix Jr. and starring Cesar Montano and Maja Salvador; Blu Bustamante, directed by Miko Livelo and starring Joem Bascon, Dimples Romana, Jun Sabayton, and Jhiz Manabat; and Sitio, directed by Mes De Guzman and starring RK Bagatsing, Arnold Reyes and Adrian Sebastian. There are ten films in the Cinema One Currents (P1 million budget) category: Angustia, directed by Kristian Cordero and Alex Medina, Maria Isabel Lopez, and Michelle Smith; Saturday Night Chills, directed by Ian Loreños and starring Joseph Marco, Rayver Cruz, and Mateo Guidicelli; Bendor, directed by Ralston Jover and starring Vivian Velez ; Shift, directed by Siege Ledesma and starring Yeng Constantino and Felix Roco; A Philippino Story, by Benjie Garcia and starring Mark Gil and Jun Jun Quintaña; Islands, by Whammy Alcazaren and starring Benjamin Alves, Luis Alandy, Mercedes Cabral, and Anita Linda; Bukas Na Lang Sapagkat Gabi Na, by Jet Leyco and starring Nika Santiago, Raul Morit, and Dan de Guzman; Iskalawags, by Keith Deligero featuring children from Camotes Island; Ang Pagbabalat Ng Ahas, by Timmy Harn and starring Jaime Fabregas, Liza Lorena, Mervin and Kay Brondial; Riddles of my Homecoming, by Arnel Mardoquio and starring Fe Hyde, Perry Dizon, and Madz Garcia. From dramas to romantic comedies to action, the movies deal with a myriad of topics set in diverse places—Chinatown, Quiapo, Corregidor, a call center office, Nueva Vizcaya, Camotes Islands, and an upscale gated subdivision.